I am FOUR MONTHS pregnant! Ahh how quickly has that gone by!? This past week has been a bit rubbish. I've had constant headaches which Chris has put down to not drinking enough and eating very little. I'm trying to force myself to eat and drink more and I've been headache free for 2 whole days! I'm trying not to worry that it could be blood pressure related. I don't want to deal with preeclampsia again. Baby is the size of an avocado, 4.5 inches long and around 3.5 ounces. It's legs are more developed and head is more erect. It's eyes are moving to the front of it's face and it's ears are in their final position. It's starting growing toenails too!! We have our gender scan on Wednesday morning. I'll be sure to update you all!! 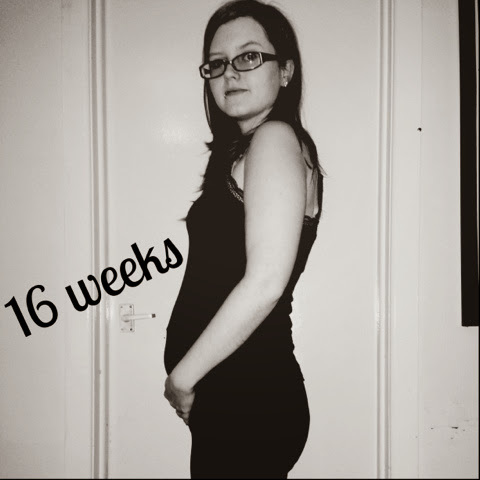 1 comment on "My Second Pregnancy: 16 Week Bump Update"
i would suggest to drink loads of water as well, i have a bottle next to me all the time, looking forward to your scan news!